Limited edition on BLACK vinyl. Gatefold cover with printed inner sleeves. 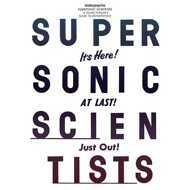 Supersonic Scientists / A Young Person’s Guide To Motorpsycho is, as the second half of that title suggests, a compilation of essential works by the band. Over the years they have worked their way into a precisely balanced groove of psychedelic rock that is only sometimes as heavy as the name Motorpsycho might suggest.